:::Before we begin, poshunleong.com would like to point out that in these litigious days it's easy to lose sight of the fact that we - as a community of kindred souls - once valued common sense. So cast back in your memory to that long-forgotten concept, focus all your mental faculties on the electric power tools and sharp blades in front of you and embrace the fact that we take no responsibility for any mishap experienced by you because your attention may have wandered. :::That said, be joyous, use all your wood scraps and add to the sum total of beauty in this world. 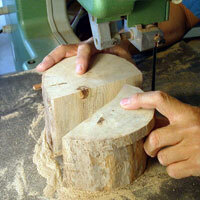 The tools you will need are a bandsaw with a 1/4” wide blade, a sander, a hot melt glue gun and a screwdriver. Finished Height: around 12”; diameter: 7”. Step by step visual instructions on making this box will guide you into creating a practical yet engaging object. 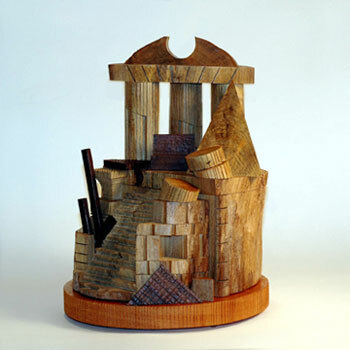 Using odd scraps gives the wood a second chance in life. The box may look complicated, but the techniques used here are simple. The project should be challenging. Try not to do everything too precicely. It is not about perfection, as the photos will show. Think of the project like having fun with Legos™. Parts can be added or subtracted and the final results can still look good. Choose different woods to give color, contrast or texture. Warning: By not following the instructions exactly, you may end up with a more interesting box. Creativity credits are earned by taking different routes! Choose a dry 6” diameter log. If there is bark on the log, you can keep it to add interest or strip it off. 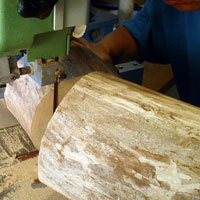 Use a fence on the bandsaw as a guide to cut a straight and perpendicular 4” long cut. Clamp the log when cutting so that it does not roll over with the blade Make sure that the cut at each end of the log is flat. You may have to sand the ends. 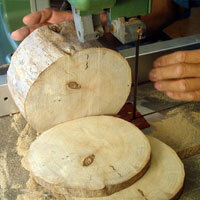 SAFETY: Please use precaution when cutting wood and wear a protective eye shield and face mask. 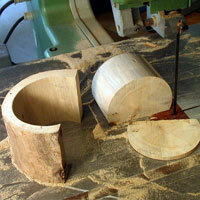 Cut off two round 1/2” sections. For contant thickness use the fence to guide the wood as the blade cuts. The outer first section is used for a roof. The inner second section is for the lid. 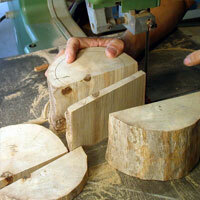 Join the pieces together and cut off approximately 1/3rd of the wood. Save all the cut sections to be used at a later stage. Cut off a 1/2" thick slice from the larger section. It will be a wall for the box. 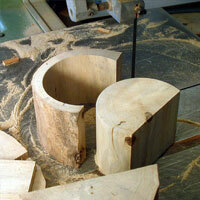 Cut out interior in a circular form about 1/2” from the edge of the log. 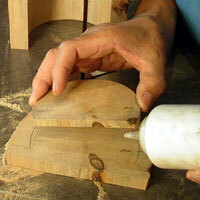 Cut off 1/2" slice from top of segment and save it as the rim for glueing onto underside of lid. 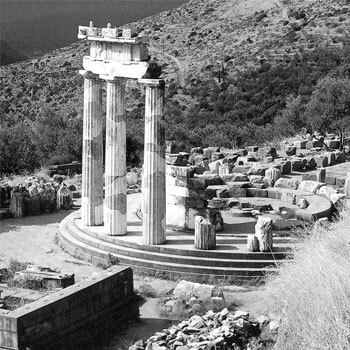 The larger segment is used for making the columns. 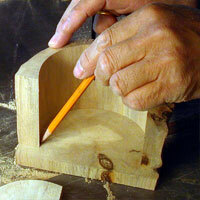 Mark out interior shape with a pencil onto underside of lid. 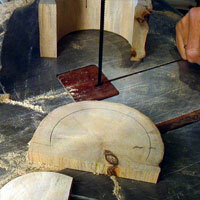 Underside of box lid - shows a pencil line indicating where to glue the rim. Glue rim onto underside of lid.